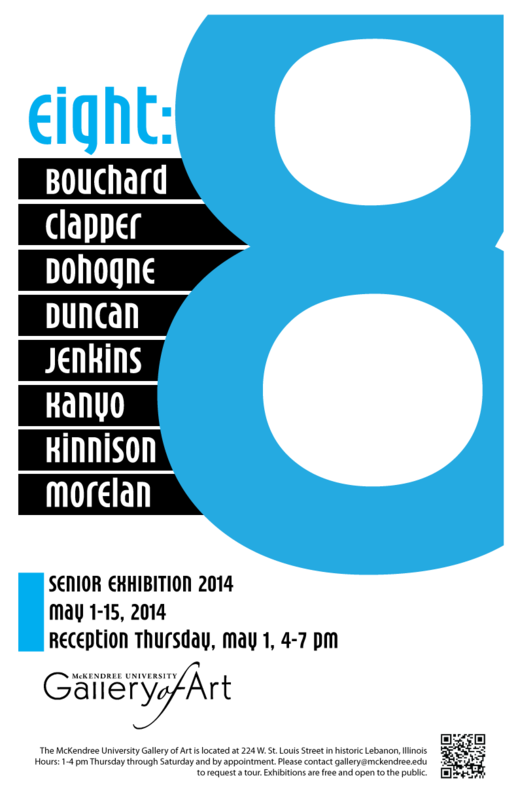 We are proud to exhibit the work of our graduating art seniors, our very own “group of eight”: Lauren Bouchard, Kelly Clapper, Meghan Dohogne, Emilye Duncan, Kayla Jenkins, Laura Kanyo, Andrew Kinnison, and Kayla Morelan. These artists present the fruits of their labors in forms of paintings, collage, sculpture, and installation. Their work is varied, reflecting individual interests and distinctive methods. Meghan Dohogne investigates the artistic expression of contemporary issues by blending American Abstract Expressionist gesture with limited color palettes derived from Japanese traditions. Kayla Jenkin’s large paintings begin as studies of the human body. Her fluid, organic figures allude to parallels found in nature. Kelly Clapper hails from Alaska. She strives (and succeeds, in my opinion) to capture the energy of her subjects with rapid brushwork. Lauren Bouchard uses her powerful color sense in Phoenix and Octopi to express universal emotions associated with inner struggle and self-discovery. Emilye Duncan questions conventions of beauty in a highly personal way. If you are an art lover, you may be acquainted with The Eight, a group of American painters working in the early part of the last century. Choices these artists made about what to paint and how to paint it challenged prevailing notions of what art should be about and how it should look. Their gritty street scenes and coarsely daubed figures seemed inappropriate and crude to the public and critics of the time. The Eight showed together only once, in New York City in 1908. Work by three of the group’s original members, Robert Henri, George Luks, and Maurice Prendergast are now part of the St. Louis Art Museum collection, which goes to show how tastes change, or how we can grow to appreciate something we don’t understand, if given a little time. Only time will tell if our “group of eight” will show together again, or grow in influence, so you had better come to the gallery and see them now. The McKendree University Gallery of Art is located at 224 St. Louis Street in historic downtown Lebanon, Illinois. We are open 1-4:00 pm Thursday through Saturday during shows. Please contact gallery@mckendree.edu to request a tour.